The General Assembly is the highest governance body of the ACT Alliance. 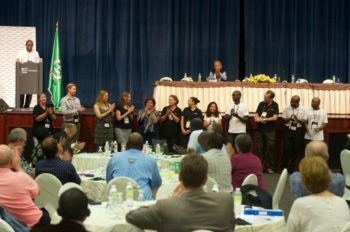 It meets in person every four years, bringing together representatives of all 145+ members of the Alliance to elect its governing board and officers, and its Membership and Nominations Committee, to revise statutes and affirm new strategic direction, and make other major governance decisions. The assembly also provides an opportunity for members to discuss and learn together around issues related to our common work, to worship together, and to share in our successes and best practices. The Third ACT Assembly in Uppsala will include a variety of programme elements. The full schedule can be found here. A number of reports covering the past 4 years will be received in plenary and public statements from ACT members, forums, and other bodies will also be voted on in the plenary sessions. Regional meetings provide a smaller venue to discuss issues, to network, and to learn together. All of the work of ACT Alliance is undertaken in the context of our role as churches and agencies working in humanitarian relief, development and advocacy. Worship is at the heart of who we are as an assembly. Our worship life will focus around the theme of Hope in Action- Putting People First and will include an opening service at the Uppsala Cathedral, as well as morning and evening worship in the plenary hall each day. Youth Participation – How can ACT make a step change in enabling youth participation across the work of the alliance? Principles of Partnership – Are steady, faithful and loving partnerships possible between members of ACT Alliance? Duty of Care – Putting people first in our work: how do we keep our staff safe, our programming effective and our alliance engaged where we are needed most? A Forum Driven Alliance – How does it look and what does it feel like? 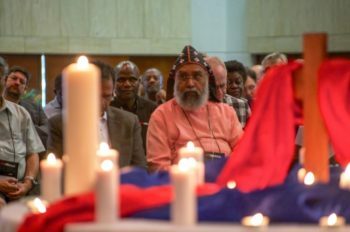 The ACT General Assembly is taking place within the context of the 70th anniversary of the World Council of Churches, the 50th anniversary of the Uppsala Assembly of the WCC, and the Swedish Ecumenical Weekend. 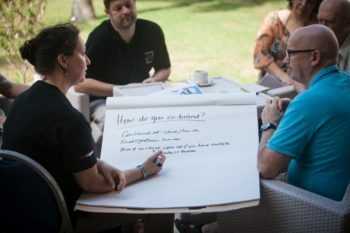 Our assembly will overlap for a day with the Executive Committee meeting of the WCC, and that time will be used to hold a special day discussing how we work together in service to the world (ecumenical diakonia) and how that work contributes to the broader agenda for sustainable development. The day will include case studies, speakers, and small group discussions about how we can and do work together in ecumenical diakonia and the contribution that makes to sustainable development. The ACT Alliance has a commitment to gender justice throughout the work and life of the alliance. A special event to highlight the importance of gender justice work and the role of faith-based organisations including ACT and its members will be held on the first day of the Assembly. Speakers will include Phumzile Mlambo-Ngcuka, Executive Director of UN Women and Archbishop Antje Jackelén, Primate of the Church of Sweden. Meal times at the Assembly will include plenty of opportunities for conversation, networking, and fellowship. Dinners will also include regional celebrations, where each region of the alliance will highlight the work and culture of their home with the rest of the participants to the assembly. Regional celebrations will inject creativity and fun, as well as learning and celebration, into our days together. 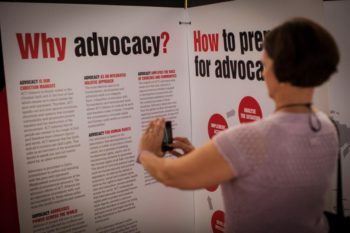 The Hope in Action Exhibition will provide an opportunity throughout the week for participants to come and visit displays hosted by ACT members, forums, advisory groups, communities of practice, as well as by external partners like the CHS Alliance, Sphere and the Partnership for Religion and Development. The Exhibition will be open Monday-Thursday, and will have a coffee station and photo corner as well as over 20 displays. Young people are not just the future, they are a key part of who we are as an alliance today. 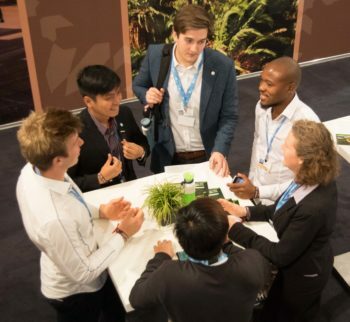 The pre-assembly meeting of the Community of Practice on Youth Participation will bring together 30 – 40 youth representatives (aged 18-30) of youth organisations that are associated with the ACT Alliance around the world. The meeting will offer those present, and the larger Community of Practice on Youth Participation, an opportunity to define who they are in the life of the alliance, organise their strategic work as youth within ACT to help build a stronger Alliance for the future, and share experiences from the work of the different organisations. The outcomes from these days will be shared with assembly participants throughout the assembly. The ACT Assembly is being hosted by ACT’s Swedish members – the Church of Sweden and Diakonia Sweden. On October 27, our hosts will offer an opportunity for participants at the assembly to learn about the Swedish experience in migration and integration, as well as some broader discussion of the European context around migration. We look forward to seeing you in Uppsala to participate in this dynamic, exciting Assembly!